The wildness of the landscape, the breathtaking view, the multicolored beaches formed by the volcano's lava and the deep blue Aegean Sea combine a picture of wild, proud and imposing beauty. Otherwise known as Thira, this volcanic island is truly unique. 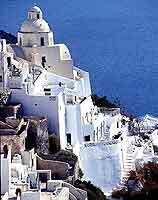 From Skala, the main harbour, sit comfortably on a donkey and climb up to Fira, the capital. Experience this charming town with its old Frankish quarter and its magnificent view of the bay where you can see Kamenes, two tiny islands made of lava. Thirassia is also worth visiting, the second largest island left from previous eruptions. But apart from the grey sand and pebble beaches and the many archaeological sites, make sure you also visit Oia, a fascinating town close to Fira. 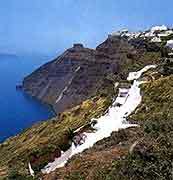 Santorini consists of three islands: Thira, Thirasia and the Aspronisi. 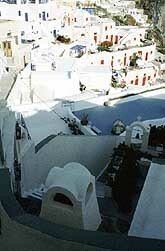 Your trip in this island, the southest island of Cyclades, will be unforgettable. You'll admire the scenery, you'll enjoy the walk through the narrow paths, you will visit ancient Thira and you'll swim in the crystal clear sea. Santorini is different from the rest of the Cyclades group by virtue of its interesting geological structure, the result of the eruptions of a now inactive volcano. The landscape is extremely imposing on the western side of the island, where little white houses perch on top of gigantic, steep rocks that plunge abruptly into the sea. In contrast to the sheer cliffs on the west, the coast on the eastern side of the island has endless stretches of beach with sand or shingle. Finikia - Lies on the N end of Santorini. There is a small pier but it is usually very crowded. There is some shelter from the meltemi. There are also a couple of tavernas ashore. Skala Thira - This is the main harbor for Santorini. There is a small quay where you can tie onto. There is a buoy of the quay where you should tie onto as the depth is too deep to drop anchor. There are several cafes and tavernas in front. There is water on the quay. Provisioning you can get from the main town which you can either get by donkey or the funicular. 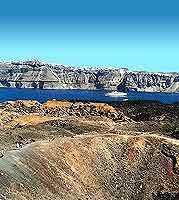 Nea Kameni - The small island located between Santorini and Thirassia. The best place to anchor is in the cove in the SE corner. There is fair shelter from the meltemi. No facilities available. In the east coast there are Monolithos, Kamari and Perissa. In the south coast there are Perivolos, Ai Giorgis, Eksomitis and Blihada.Beaches near Ia are Armenis, Ammoudi and Mpaksedes. Sports Windsurfing. If you don't have your own surfboard, you can rent one on the island. Everything you could ask, you'll find it here. In Fira you can find buzukia, discos bars, pubs and a cinema. In Ia, Kamari and Perissa you can find bars, pubs and clubs. At Imerovigli, Emporio and Pirgo Kallistis you can find buzukia. An ancient Minoan city is located to the south of the present village of the same name. Excavations are still going on. Nevertheless you can walk in the streets of the ancient town. This site has been known since 1870 when two members of the French Archaeological School, Mamet and Gorceix, carried out the first excavations. In 1899, Robert Zahn carried out minor excavations at the site of Potamos. The present excavations were commenced in 1967 by Professor Marinatos who was killed in an accident in the area of the settlement in 1974. A large part of the city has been brought to light. Nevertheless it is estimated that excavations will continue for a further 100 years. There is also a castle in the village (goulas) which is now ruined. This castle withstood the Turkish invasions until 1617 when it too passed under the Ottoman yoke.